Liberty Tire Recycling has donated 500,000 pounds of rubber to build athletic fields in Iraq. 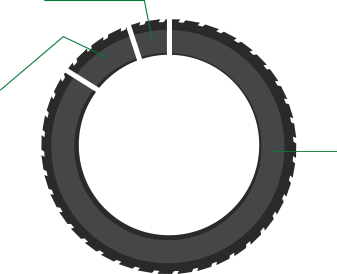 Tires are manufactured for safety and durability, which presents a challenge when they reach their end of life. Liberty Tire Recycling collects your scrap automobile, truck and off-road tires, and offers remediation services for scrap tire dump sites to manage end-of-life tires in an environmentally safe way. Our network of over 25 advanced processing plants converts these scrap tires into raw materials that can be reused for benefical products, such as molded rubber goods, rubber flooring, rubberized asphalt and shock-absorbing athletic surfaces, as well as playground and landscape mulch. For National Collection Service account programs, please contact us at NTR@libertytire.com or call 205.854.0130. We have the largest fleet of trucks and service vehicles in the tire recycling industry in North America. We offer a mix of well-maintained vehicles to better serve our customers’ specific cost, safety and location needs. Our truckers are highly trained, with flexible schedules to meet your time constraints. With the largest network of tire recycling facilities in North America, Liberty Tire Recycling is a one-stop tire collection company. Tires of every shape and size are collected at more than 60,000 retail locations nationwide. We maintain a network of door-to-door reclamation services with processing plants at strategic locations throughout North America. Liberty Tire Recycling provides three scrap tire collection options for your convenience. We dispatch our fleet of box vans daily to customer sites, removing scrap tires by hand on a periodic basis to keep our customers’ facilities clean and safe. Customers who choose drop-and-hook pickup are left with bulk trailers to fill at their convenience, and we take the load away with a tractor when full. If you want to do it yourself, we accept tire deliveries at most Liberty Tire Recycling facilities. You can find the most convenient location here. Abandoned tire piles are a serious environmental concern faced by communities across the country. Liberty Tire Recycling works with communities to remediate abandoned scrap tire piles. We have remediated more than 150 dump sites littered with nearly 40 million scrap tires in Georgia, Indiana, Kentucky, New York, North Carolina, Ohio, South Carolina, Virginia and West Virginia. We maintain a network of tire collection and reclamation facilities with more than 25 advanced processing plants strategically located across North America. We use innovative tools and technologies to recycle scrap tires into reusable raw materials, such as crumb rubber, rubber mulch and industrial feedstock. Different industries and manufacturers then transform these materials into a wide variety of smart, sustainable products: rubber mulch for playgrounds and landscapes, welcome mats, vehicle mud guards, speed bumps and anti-fatigue mats; construction materials for roads and civil engineering projects; fuel for burning, reducing carbon emissions; and cushioning for equestrian surfaces, tracks and athletic fields.